Reading the press of the "orthodox" Trotskyist movement from the 1940s inescapably suggests a question: didn't they have access to the serious bourgeois press? They did, of course. Yet their picture of the world and what was happening in it was gappy, patchy, selective, and vastly distorted by the narrow-focus ideological spectacles they had strapped on themselves. Stalinism dominated and shaped the would-be left for two thirds of the 20th century. Its consequences still warp and shape much of the would-be left, including organisations that are ostensibly anti-Stalinist. 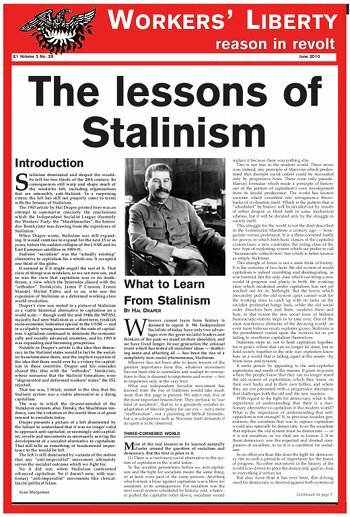 To a surprising extent, the left has still not properly come to terms with the lessons of Stalinism.